A schizophrenic man who pleaded guilty to killing a father in north London months after being fined for another attack has been jailed for life. 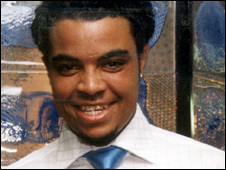 Colin Welsh, 42, of Tottenham, north London, stabbed Elliot Guy, 27, in the neck in Tufnell Park in July 2008. Four months earlier he had been fined £200 for attacking a fellow university student in Scotland in 2006. He admitted manslaughter by diminished responsibility and will serve a minimum of 12 years in prison. The Old Bailey heard Welsh had a history of violence and drug taking, with dozens of convictions dating back to the age of 15, including actual bodily harm and possession of knives. He was also suffering from mental illness and heard voices he believed were coming from a transmitting device placed in his ear, the court was told. Welsh attacked a fellow student in 2006 at St Andrews University where he was studying philosophy, leaving him needing reconstructive surgery to his face. He was sentenced at Cupar Sheriff Court in March 2008 when he was fined £200 and ordered to pay his victim £300 compensation. Judge Brian Barker, the Common Serjeant of London, said the decision of Cupar Sheriff Court not to send him to jail over the earlier attack was "merciful". He added: "Your violent side was never far away. You displayed erratic and frightening behaviour and clearly had deep underlying mental illness." He had rejected defence submissions that Welsh should be sent to a mental hospital indefinitely rather than being given a life sentence. Mr Guy, a cabinet maker from Hanwell, west London, had become a father just 12 weeks before he was killed. His partner Amy Smith described him in a victim impact statement as a "wonderful, warm, gentle and paternal man" who doted on daughter Eleanor. Outside court, the victim's mother, Sally Jayne Brown, said: "He [Welsh] was guilty of so many sick crimes before he did what he did to Elliot. Finally my son can rest in peace."